Manchester United (4) : Chicharito[20';53'], P.Jones[87'], Fabio[90']. Norwich City (0) : - . Lindegaard; Rafael, Ferdinand, Vidic, Büttner; Zaha (Rooney 78), Cleverley (Anderson 89), Jones, Young; Januzaj (Fabio 90), Hernandez. Substitutes : Amos, Anderson, Rooney, Giggs, Smalling, Fabio, Valencia. Bunn; Whittaker, R. Bennett, Bassong, Garrido; Snodgrass, Fer, Johnson, Redmond (Murphy 76); Hoolahan (Hooper 89); Elmander. Substitutes : Nash; Martin, Howson, Hooper, Pilkington, Becchio, Murphy. 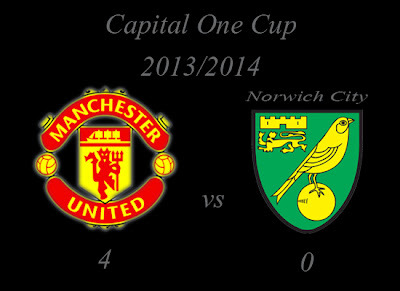 How do you think about Capital One Cup : Manchester United vs Norwich City?